Tom McLoughney was the first MacDonaghs player to win an All-Ireland senior hurling medal with Tipperary. He normally operated at full-forward in an era when defences took no prisoners. Tom was a fearless competitor with a great “paw”. His easy-going manner off the field belied a fierce determination on it when he pulled the club or county jersey over his shoulders. Tom attended Ardcroney N.S. where Con Heffernan, one of the pioneers of juvenile hurling, was the principal. Under his influence Tom began to rapidly develop as a hurler. In 1951 he played his first juvenile game for Kilruane MacDonaghs against Shannon Rovers. At that time he had no aspirations to wear the blue and gold. His ambition was to make the club senior team and win a North medal. In Tom’s first year in juvenile ranks MacDonaghs won the North championship defeating Moneygall in the final. He was the youngest player on the Kilruane team. In 1951 the Borris-lleigh senior team was at the height of its powers. Tom’s idol as a juvenile was Paddy Kenny, one of the stars of that team. In 1955 Tom was on the juvenile team that lost to Toomevara in the North final. The Guardian report lauded Tom’s performance: “Outstanding player for MacDonaghs was Tom McLoughney, first as full-forward and later at centre field and centre-back. Displaying tireless energy he fought to the final whistle and was always a danger to Toomevara.” Tom graduated to the minor team but failed to add to his juvenile medal. In 1956 he was a substitute on the MacDonaghs team that won the North junior championship. 1959 turned out to be a vintage year for Tom. Early in the season he was playing on the junior team. He soon made his debut for the Kilruane senior team in a championship match against Borris-lleigh. Tom’s direct opponent was Timmy Ryan and he freely admits that he got a lesson in hurling from the great Timmy. The North Final of 1959 saw MacDonaghs end a fifteen-year barren spell by defeating Toomevara in the decider on an 0-11 to 1-4 scoreline, thus avenging the defeat by the Greyhounds in 1958. The county final against Thurles was played in Roscrea. Tom had a superb game on the “Rattler” Burns. The Guardian wrote that Tom’s “second half goal was a brilliant piece of work.” However, despite a great display by the entire MacDonaghs team, they failed to break the dominance of Sarsfields. Tom’s displays in the championship attracted the attention of the county selectors and at eighteen years of age he made his league debut for Tipperary against Galway in Pearse Stadium. Thus in the one year he had progressed from club junior hurling to the inter-county scene. In 1960 Tom collected his first league medal with Tipperary and he scored two goals in his championship debut as Tipperary had a big win over Limerick and he followed with another brace of grren flags in the semi-final victory over Waterford. Tom won the first of his three Munster medals when the Premier county overcame Cork in the decider. In the All-Ireland final Tipperary were red hot favourites but failed sensationally to Wexford. Tom, lining at full forward, was marked that day by Nick O’Donnell who was later chosen on both the team of the century and team of the millennium. Without hesitation, Tom says that O’Donnell was the greatest player he ever marked. In the 1960 North Final Toomevara reversed the ’59 result in convincing fashion. Tom was well policed in that match by Matt Hassett whom he considers the most difficult opponent he faced in club hurling. 1960 also saw Tom win his first Oireachtas medal. In 1961 Tom collected his second National League medal. In the Munster final Tipperary overcame Cork in Limerick. Tom was injured in that match in controversial circumstances and had to leave the field after twenty-two minutes. In the All-Ireland final he won his first Celtic Cross when Tipperary had a narrow win over Dublin. For good measure he picked up his second Oireachtas medal. In 1962 Tipperary defeated Waterford in the Munster final. In the All-Ireland final against Wexford, Tipperary made amends for the 1960 defeat and Tom had his second All-Ireland medal. Tom opened the scoring in this game with a goal and as it was the first ever televised All-Ireland his green flag turned out to be a historic score. The Irish Independent described Tom’s goal as follows: “In the opening seconds Wexford needlessly conceded two line balls and from the second, cut in by Theo English, Tom McLoughney fastened on to it to give Pat Nolan no chance with a scorcher to the net.” On the club front MacDonaghs failed in a titanic struggle to stop Toomevara from taking a hat trick of titles. A crowd of 3,000 witnessed an epic match as the Greyhounds emerged victorious on a 4-9 to 5-4 scoreline. Tom made his last appearance for the county side against Waterford in the 1963 league final. 1963 and 1964 were unproductive years for the Kilruane senior team. The following year MacDonaghs had a dramatic win over Lorrha when a late Sean Williams goal snatched victory in the North final, giving Tom his second divisional medal. The Guardian report said that “McLoughney did great work in the first half.” Tom scored 1-2 and was involved in the four-man move that saw Sean Williams rifle a rasper to the net for the winning goal. Defeat by Lorrha in the ’66 semi-final and the ’67 losers’ group final heralded the breakup of that team. Tom continued playing for MacDonaghs until 1971. He started that season as a reluctant reluctant goalkeeper. Tom made his final appearance in the club jersey in Semple Stadium when MacDonaghs lost to Ballybacon in the county championship. He came off the bench and true to form, as he had often done before, he stuck one in the “onion bag” and added a point for good measure. The greatest disappointment in his career was that a county medal eluded him. However, Tom was a selector on the Kilruane MacDonaghs team that won three county titles in a row, 1977 to 1979 — he had also been a senior selector in 1975 and 1976. Tom was also a county selector in 1980. 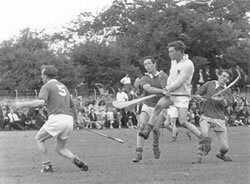 Tom was selected as full-forward on the North Centenary hurling team (1951-2001). In 2012 he was presented with a Sean-Ghael award in recognition of his outstanding service to Kilruane MacDonaghs. Tom is still actively involved in the club. In 2010 he was elected vice-president and in 2013 he was appointed as one of the presidents of Kilruane MacDonaghs. All-Ireland senior (2); Munster senior (3); National League (2); Oireachtas (2); St. Brendan Cup (1); North senior (2); North junior medal (1); 1 North juvenile (1).